SEOUL, Oct. 11 (Yonhap) -- South Korea will completely denuclearize the Korean Peninsula and establish permanent peace, President Moon Jae-in said Thursday, stressing the need for strong defense capabilities to support such efforts. Moon has held three bilateral summits with North Korean leader Kim Jong-un, in which the leaders of the two Koreas agreed to end their hostility and denuclearize the Korean Peninsula. In their third and latest summit held in Pyongyang last month, the two Koreas also signed what Moon has called a de facto non-aggression pact that said the countries will not use any military force against each other "under any circumstances." Still, the two Koreas technically remain at war as the 1950-53 Korean War ended only with an armistice, not a peace treaty. Moon reiterated the fact, saying, "The Korean Peninsula is in a ceasefire." The South Korean president has been pushing to formally end the Korean War, which he says may also help motivate the communist North to further accelerate its denuclearization process. The U.S., however, apparently remains reluctant to do so, with President Donald Trump insisting on the need to maintain maximum pressure until the North completely denuclearizes. 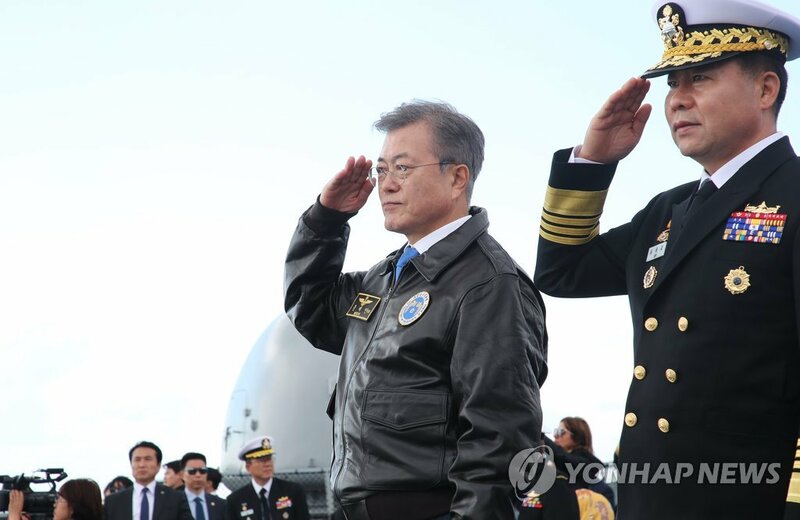 "The road to peace may not be easy but the Republic of Korea will walk that path to the end," Moon said Thursday in his opening remarks at the Jeju international fleet review. Moon also highlighted the importance of a strong military to promote and establish peace. "What we must have to reach the destination of peace and prosperity is a strong defense capability. And among such capabilities, naval power represents the national strength of an open, trading nation," he told the international event attended by the navies of 12 other countries. "I will further strengthen the Republic of Korea Navy so it may go beyond the Korean Peninsula and contribute to peace in Northeast Asia and the entire world," Moon added.